Hello. 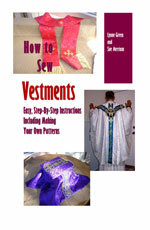 Can you tell me what standard measurements you would use to make a small childs chasuble? Thank you. You determine the width of a chasuble by measure the child (or adult for that matter) from the back of his neck to his fingertips. The width would be measured from the back of the nape of his neck to his fingertips. It is straight across, from fingertip to fingertip with the head in the middle. For the length of the chasuble, measure from the shoulder to three inches below his knee. The head hole will be the same size as an adult, because a child's head is about the same size as an adult's.